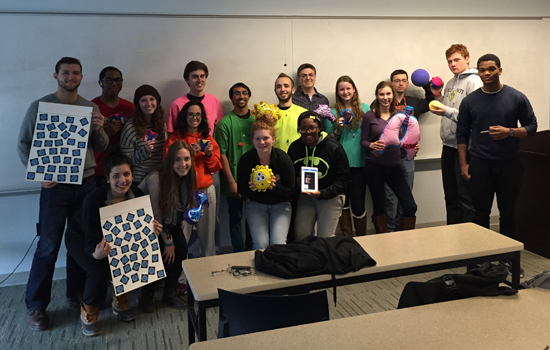 Members of RIT’s Premedical Student Association make learning about the immune system—and how to stay healthy—fun with their exhibit, the Adventure of the Immune System. Rochester Institute of Technology’s Premedical Student Association invites visitors to the Imagine RIT: Innovation and Creativity Festival on May 2 to play “The Adventure of the Immune System,” a game of good health for all ages. The game casts the participants as doctors who must diagnose their way back to health and defeat evil pathogens threatening to harm their immune systems. Through the three stages of the game, visitors will learn how pathogens weaken the immune system, how the body’s defenses fight diseases and how healthy choices can help prevent illness. Visitors will spin the wheel of fate at table No. 1 in the Gordon Field House to begin the game with one of five pathogens—flu, common cold, food poisoning, pneumonia or tetanus. Healthy choices made at table No. 2 win participants an arsenal of antibodies to throw at students designated as pathogens and beat the disease. The game ends at table No. 3, where visitors will learn how to prevent catching the illnesses in the game. RIT’s Premedical Student Association is a large club, with 30 active members and more than 200 people on the email distribution list, Malchoff noted. In addition to Malchoff, other PSA students who contributed to the exhibit include Jacob Scott, Rebecca Wilhelm, John Bennison, Zohal Tawakali, Delanie Kneeland, Elise Grzeskiewicz, Natalie Walters, Jrew Simmons, Logan Adamczak, James Bice, Abbey Siulinski, William Marmor, Danielle Kindron, Madison Rose, Alyssa Ratajczak, Lindsay Smith, Kyle Burke, Brittany Blanchard-Collier, Megan Bolger, Sarah Clayton, Rachel Rabenn, Lily Trabold, Emmanuel Perrodin-Njoku, Than Oo, Rosemary Carter, Karnan Rajkumar and Anthony Hanna.